CALGARY -- It has been one year since rain pounded the foothills of the southern Alberta Rockies -- heavy, relentless rain more typical of a tropical storm than a late-spring shower. In Canmore, more than 200 millimetres fell in 2 1/2 days, 10 times the amount of a typical rainfall that time of year. 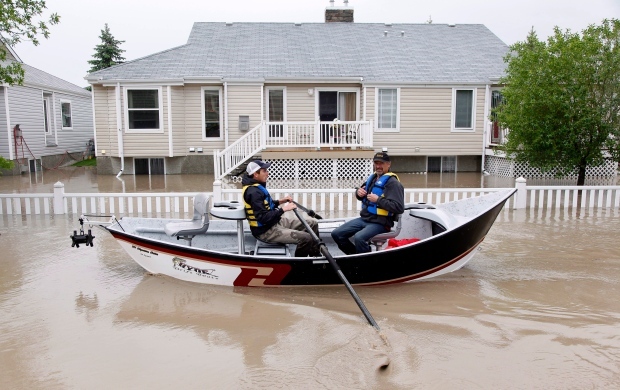 A torrent of floodwater from the headwaters of the Bow and Elbow rivers swept through streets and homes in such communities as Exshaw, Bragg Creek, High River and eventually through the heart of downtown Calgary and on to Medicine Hat. As many as 100,000 people scrabbled for higher ground any way they could -- in canoes and boats, in the backs of combines or in the scoop of a front-end loader. Some swam for their lives. Marion and Paul Kutzer, semi-retired, Canmore, Alta. Marion and Paul Kutzer will always remember June 20, 2013. It was the day they finally paid off the mortgage on their spacious home with a vivid view of the Rocky Mountains along Cougar Creek in the mountaineer's mecca of Canmore. It was also the day that Cougar Creek, which often flows at little more than a trickle, roared over its rocky banks, cut a swath through their home of 18 years and forced them to flee to safety. 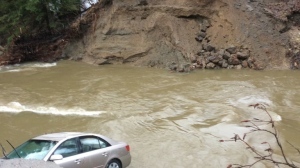 Canmore was the first community to feel the full wrath of the extensive flooding that caused billions of dollars of damage throughout southern Alberta. Sitting on their second-floor balcony, the sound of heavy equipment roaring in the creekbed below as flood prevention work carries on, the couple's memories are fresh. "When it first happened I was totally gutted. I had no spirit left and now I'm going to get emotional again," said Marion, 63, brushing away tears. "The people that support you and the family that supports you -- that's what gets you through it. It's so crazy that after a year it just comes rushing back all at once." The Kutzer house was one of more than 40 homes severely damaged in Canmore. The water cut a path through the back of the house and swept away furniture and belongings. It ate away the ground beneath the foundation. It took months before the Kutzers even knew if their home could be salvaged. They couldn't go back for seven months. "I think it probably took us a week to kind of get over the shock of the massive damage. Then came the next phase -- the disaster relief -- and that to me put more tension and frustration and more stress on me than the house," said Paul, who, at 72, is semi-retired. The province's disaster recovery program covers the cost of repairing uninsurable property damage. As of early June nearly 10,500 people had applied and $71 million had been paid out. 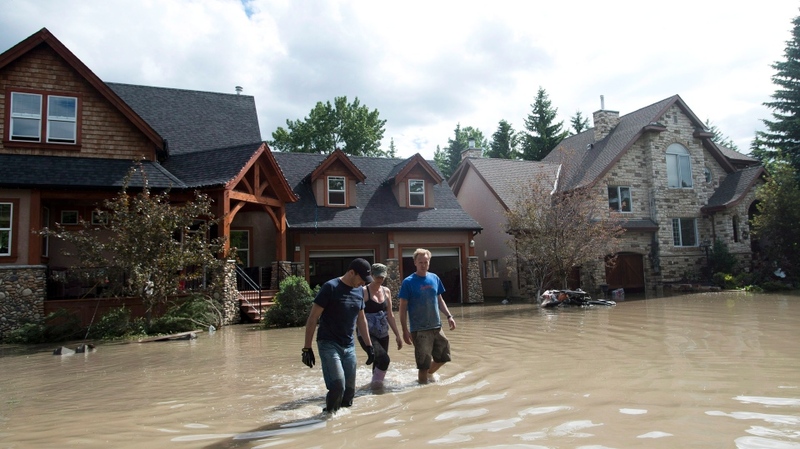 But the couple is critical of the Alberta government's handling of flood relief. Paul said the process is "shrouded in secrecy" and the money has been slow to come. He estimates the couple is still waiting for up to $45,000 in cash from the disaster relief program. He has mixed feelings about how the flood coincided with paying off the mortgage. The disaster recovery program only covered base level finishings. "It's kind of ironic. Now because of the Alberta system, we're not going to be reimbursed for all of the damages, and we're back in the hole again," he said. "We bottomed out, that's for sure. We're going to have to go into debt again." Barb Teghtmeyer, operator, Bragg Creek Trading Post, Bragg Creek, Alta. Barb Teghtmeyer remembers working in her family's Bragg Creek Trading Post as a young girl. The historic building began as a fur-trading venue in 1925 and her father bought it in 1940. It served as both the family business and the family home. Teghtmeyer took over the trading post in 1986 after her mother died. But when the Elbow River across the road burst over its banks last June, everything changed, forever. "The worst damage was to the store itself. It took out probably 95 per cent of the inventory, which was native arts and crafts which seem to have just disappeared somewhere down river," Teghtmeyer said. She expects what was lost will probably never be recovered. "The worst emotion I had is much of the history is gone. This building has been operating as a store since the mid-1920s, and no matter what we do here, we will never make it the same because many, many things in there were from the '20s," she said, fighting the tears. "I almost felt like I was the keeper of the history and I let them down. That's the worst." A year later, renovations continue to try to return the log building to its former glory. But its future remains in doubt. "It's been a tough year. It was a devastating blow at the time and it really doesn't get much easier as time goes on, as you discover more and more that's damaged or broken or missing." Growing up on the river, Teghtmeyer said she was raised to be nervous about floods and she'll never, ever take staying dry for granted. The town of 600 has decided to hold off on its one-year commemoration of the disaster until this flood season has passed. "We will never be the pastoral little country getaway that we were before," Teghtmeyer said. "The town will never be the same, but it will come back." Jamie Ellice, the Hamptons neighbourhood in High River, Alta. There's still a lot of sadness in High River a year after flood water turned many of the town's streets into rivers and neighbourhoods into lakes, but Jamie Ellice isn't complaining. He's just happy to be home. "The sad thing is there is a bit of doom and gloom from some people," said Ellice, standing in the living room of his refurbished home in the Hamptons -- the hardest-hit area in the hardest-hit community. "I don't think it's the majority and I think the people who do have that attitude are choosing to leave, or have left, which is OK because the rest of us who are here we want to be resilient." The Hamptons, full of upscale new homes and tree-lined streets, was left under water for several weeks as emergency officials scrambled to pump out millions of litres that overwhelmed about a third of the community of 12,000 people. Ellice, along with his fiancee Kristi, had been living in the home for about four months before the flood hit. The house was decimated and had to be stripped down to plywood and studs. Ellice initially stayed with his cousins, then house-sat for a friend and eventually rented a basement suite in High River for the final six months. Eleven months after the flood, the couple was finally allowed to return. "It feels like a house again. We've been back in for a few weeks now and I will admit the first little while we were here it felt weird," he said. "It's getting better. We're feeling more settled." Still, 13 houses on his street sit unoccupied. Plywood has been nailed over doors and windows. A window on the second floor of one home remains wide open the way it was left last spring. There's a vacant lot where one house was demolished. Ellice, a realtor who grew up in High River, believes flood mitigation measures, including colossal berms along the Highwood River, will prevent a recurrence, but realizes not everyone feels the same way. "I can see there are some areas of High River where people are going to be a little nervous. I don't have that nervousness, but I've lived here my whole life. "For something like that to happen in back-to-back years would be astronomical. It would be like getting hit by lightning twice." The memories of what happened a year ago, he predicted, will fade. "We've got our whole lives to go forward from here and we plan on doing a lot of that living from this house." Geoff Last arrived at the high-end wine store he manages just in time to see a police boat pass by. It was then he knew there would be more than just a puddle or two inside Bin 905 Wine & Spirits, a few blocks from the Elbow River in Calgary's trendy Mission neighbourhood. The power was out, which meant the store's shutters couldn't be lifted. It would be another few days before staff were able to get inside. "It sort of looked like the hull of the Titanic in here. It really looked like an underwater ship. It was quite amazing." The water was more than a metre deep in the store. Bottles of wine -- some expensive and rare -- bobbed along. "It's really quite amazing. It made me feel really good about this city." Any bottles below the water line were lost. Some may still have been drinkable if they were sealed with natural cork that hadn't been damaged. "But from a collectability point of view, they're virtually worthless, because the labels have been damaged. We certainly can't resell them." Bin 905's insurance company took those bottles. Last said he's not sure what became of them. All told, Bin 905 lost about $250,000 worth of merchandise. Nearly a year after the flood, the store is still sorting out its insurance claim. In the meantime, Bin 905 has been gutted and transformed into a modern, sleek new space. It reopened about 10 months after the flood, one of the last businesses on Mission's main drag to do so. Customers are picking up again and things are "almost back to normal," said Last. "All I can say is we're glad to be back and we really hope things stay high and dry for some time to come."